"It started already, it'll over by the time I get there," I thought. Still, it was a few short blocks away from where I live. I walked there, and the line was long but sure, why not? The line's this long, it's got to be good! While in line, I pieced together that it was a pop-up shop, and that people were getting t-shirts promoting his new album. OK, free t-shirt, cool. Four guys ahead of me didn't want to wait an hour for a t-shirt (or something?) and didn't know what would have been in store for them. I hung out, trying not to eavesdrop on the conversations in front of me. One woman was told by someone she knew that they had run out of t-shirts, and was almost convinced to leave the line. She stuck with it, and I ended up in the alley with a bunch of people, listening to some Drake tracks, when all of a sudden someone said, into a microphone, "What's up?" 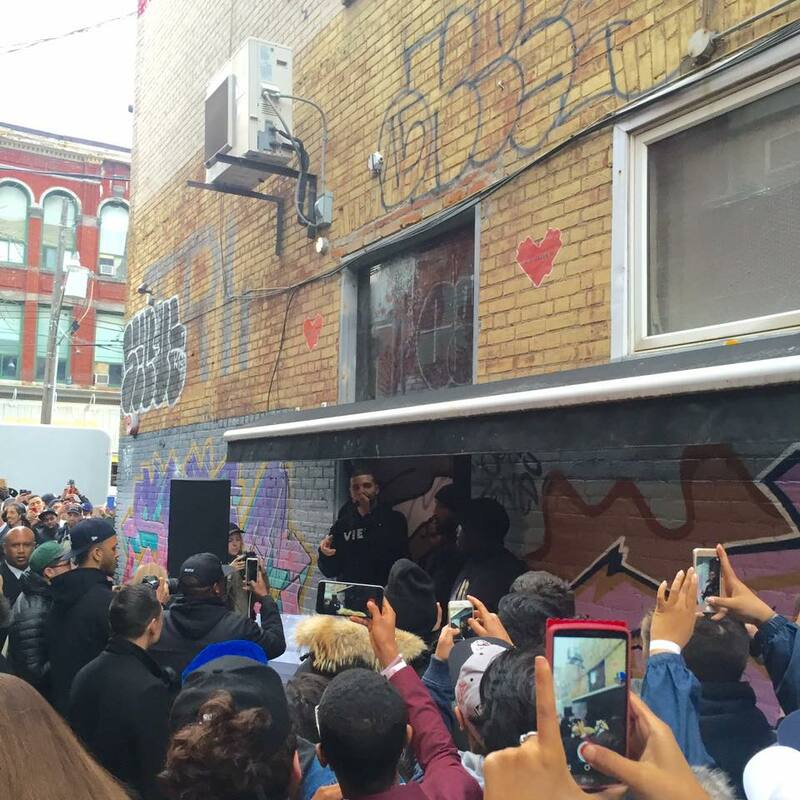 Euphoria as Drake, the man himself, stepped out the door, smiling and winking at everybody. This was a dream come true for a lot of people! Since I'm tall, I offered to take photos for the family behind me, who couldn't see over everybody. I also let them go ahead of me. It was a bigger deal for them than it was for me. Lots of people gave dap to Drake and some got selfies with him. The guy is the master at the well-timed flash of the "six" and smile just as people clicked their selfie. No selfie for me, though. I just shook Drake's hand. I think he wanted to lock thumbs with me but I am definitely not at all cool enough for that. At least he looked into my soul, oh so briefly. Did the people ahead of us not get to meet Drake? Are they now thinking "All I got was a t-shirt?" For me, it was another thing that happened that was only possible because I moved to Toronto.